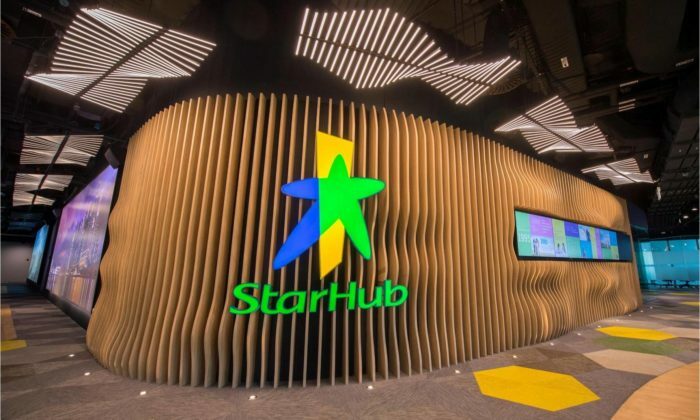 Following news of a workforce reduction of 300 employees as part of a restructuring, local telco StarHub has seen its Buzz score falling to zero, according to YouGov. 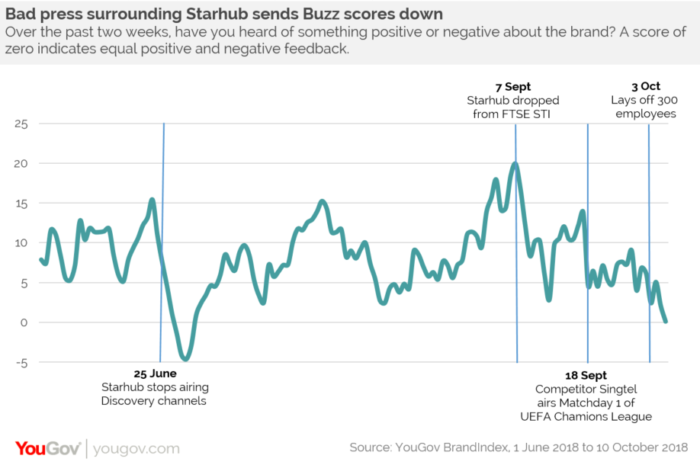 YouGov’s Buzz score measures whether or not a person has heard something about a brand and whether or not it was positive or negative. That being said, this was not the first time StarHub saw a dip in its Buzz scores with the telco starting its third quarter with a score of +7. This was following the recent ending of StarHub’s decade-long partnership with Discovery Networks, which pulled the plug on seven Discovery Network channels on the StarHub platform. Within a month of this incident, StarHub’s Buzz score also fell to an all-time low of -5. “In all the time YouGov has tracked StarHub, this was the only time this metric has entered negative territory,” the report said. Another major drop came two months later when the FTSE Straits Times Index revealed it would be dropping StarHub from its list. StarHub’s score evening fell from a +20 to +3 in two weeks. Aside from impact seen by corporate news, StarHub’s Buzz scores also declined following poor customer experiences. The telco experienced low scores leading up to the latest season of the UEFA Champions League when the media reported on the company’s difficulty in securing broadcasting rights. On 18 September, scores fell from +14 to +5 in 24 hours when its competitor Singtel aired Matchday 1. StarHub’s current customer score, which measures how many consumers subscribed to the telco provider, fell by five points. “In Singapore’s competitive telco landscape, consumers are sure to pay attention to a major player like StarHub. From its content availability, to corporate announcements, people are quick to react and chat about the brand; particularly when there is an impact on their customer experience,” Ervin Ha, head of data products, said. Most recently, StarHub and Jeannie Ong, chief strategic partnership officer (CSPO), parted ways. Ong had been with the company for over 17 years in numerous roles, most notably as CMO for the brand and SVP and head of corporate communications & investor relations. With her departure, the responsibilities of the CSPO role were combined with other functions to create a new chief corporate officer role helmed by Veronica Lai, making the CSPO role has been made redundant. Earlier this year, StarHub appointed Peter Kaliaropoulos as CEO, taking over from Tan Tong Hai who stepped down in May this year. In June, the company saw the exit of CMO Howie Lau, who took up a role as chief industry development officer and group head of IDG at IMDA. Meanwhile, Oliver Chong, vice president of brand experience, left to join Mediacorp as head, consumer marketing. Starcom MediaVest Group has promoted Ranganathan Somanathan to chief operating officer for Southeast Asia, as the company makes it..
Swiss International Air Lines has appointed Mindshare Singapore to take care of its media planning and buying duties ahead of the .. Global – Worldwide mobile transactions are tipped to hit US$171.5 billion in 2012, a 62% jump on 2011, and the numbers are only ex..
“We are excited about the opportunities this integration will present to clients,” Shreeniwas Iyer, CEO at Vocanic, said. ..